About | What's Green with Betsy?!? 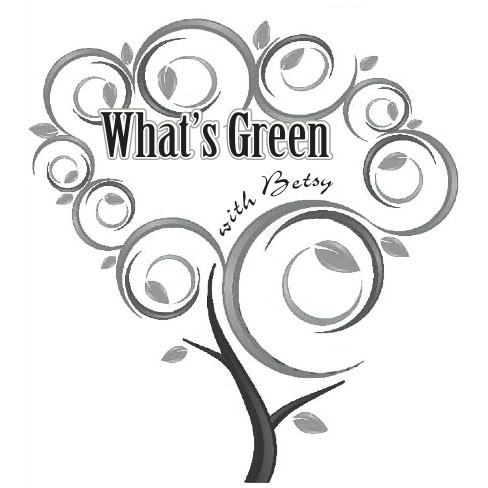 Welcome to “What’s Green with Betsy”. I have been passionate about good health and protecting the environment since the early 1970’s and am eager to share my knowledge. I am convinced that even the smallest change can make a big difference – for you, the earth and your pocketbook. I want to answer your questions on how to “go green” and how to move towards a more healthful lifestyle. I want to help you sift through the onslaught of green information coming at us daily. I will recommend simple steps you can take, suggest specific products, give healthy home and personal care tips, or just plain offer advice about making a difference, big or small. I even provide recipes for safe alternatives to lawn pesticides, household cleaners or skin care products using kitchen ingredients. It’s simple really, what’s good for you is good for the planet and what’s good for the planet is good for you. Let’s make the world a safer, healthier and better place. I have been an environmental and an organic lifestyle advocate since the 1970’s. My husband and I own several “green businesses” – Boston Tree Preservation, an organic based tree care company; Cape Tree Preservation, a “branch” of Boston Tree Preservation; Arborjet, which manufactures environmentally safer products and formulations for the control of exotic invasive insect pests in trees; and our newest venture converting a 35 acre seaside cranberry farm in Sandwich, MA to an organic tree/vegetable/herb farm. Formerly, I managed the promotional and educational materials for Boston Tree Preservation, as well as spearheaded efforts to make the businesses even greener. I am the mother of 3 grown children.